Normally for a Nebraska win, I would open up the Play of the Game to Twitter with a poll. However, this week, Coach Mike Riley singled out one play in particular and who am I to disagree? This week’s Play of the Game is De’Mornay Pierson-El’s 63-yard punt return. Trailing 10-7 midway through the second quarter, the defense forced a three-and-out. Rutgers punter kicked the ball deep to Pierson-El, 46 yards toward the right sideline. Pierson-El had two gunners on him almost immediately, but he took a step or two back, planted his foot, then exploded up the sideline right past the would-be tacklers, running through the arms of one of them. “We had two guys that were free at the point of attack and we just didn't finish the tackle,” Rutgers coach Chris Ash said. “Both of our guards that were down there didn't finish the tackle the right way. When that happened some guys got out of the coverage lane and he was able to go and get out." Pierson-El blew by another Scarlet Knight, then received a block on the sideline at the 40-yard line. He crossed midfield and started angling back across the field, running through another tackle (which he had to do because corner Tony Butler sort of cut off his cut-back lane trying to get out in front of the return). Pierson-El made it all the way over to the opposite sideline with Butler and corner Jeremiah Stovall throwing blocks, but as he cut it back looking for the end zone a Scarlet Knight finally got him down just inside the 5-yard line. The return went for 63 yards, the longest by Pierson-El since his 80—yard return for a touchdown in the overtime win against Iowa in 2014. Pierson-El made a name for himself as the most dangerous punt returner in the country as a freshman, but injuries and poor return schemes had turned him into a shell of his former self. Last week against Northern Illinois, Pierson-El made several questionable decisions about fielding or not fielding punts, and he entered Saturday with 13 yards on five returns. But all he needs is a sliver of daylight, and when that opportunity came on Saturday he took advantage of it and gave the Huskers a huge momentum boost. On Nebraska’s first snap following the return, running back Mikale Wilbon punched it into the end zone to put the Huskers up 14-10. 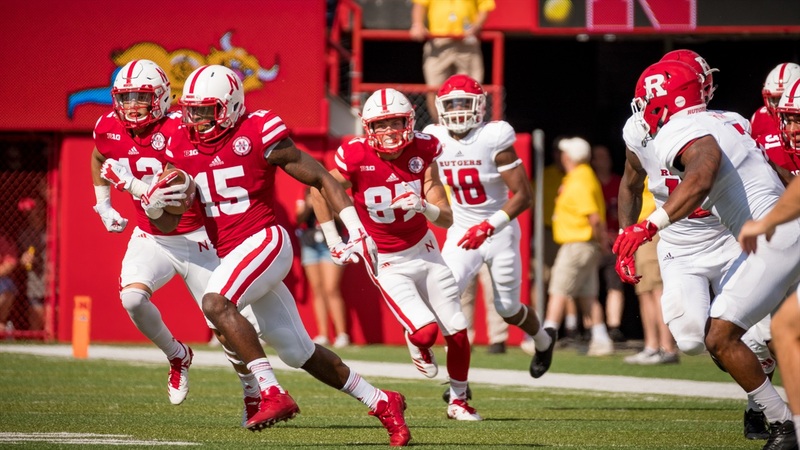 Last week, Nebraska dug itself a hole, started pressing and compounded the early mistakes. This week, the Huskers rallied — even after another pick-six from Tanner Lee — and Pierson-El’s punt return was a big part of it. That’s why De’Mornay Pierson-El’s 63-yard punt return is this week’s Play of the Game.